Hi everyone. I hope you all had a wonderful Easter Bank Holiday! 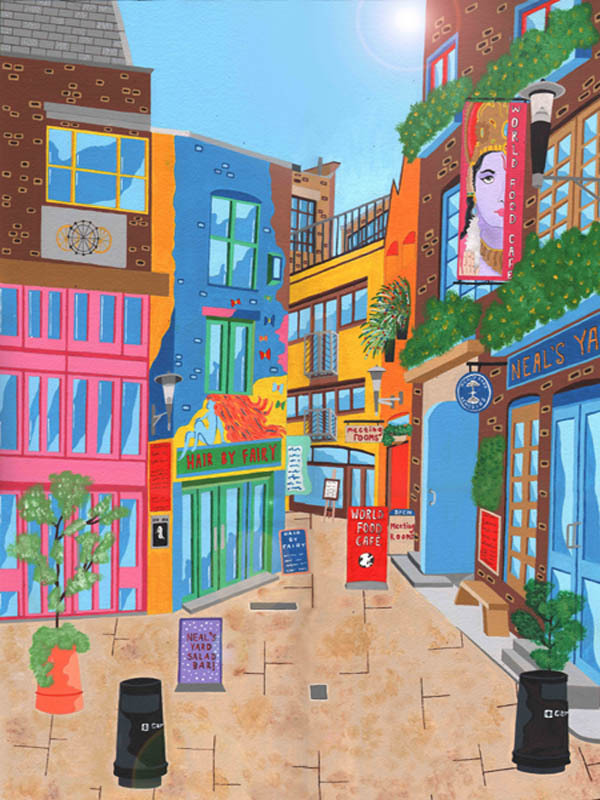 Here I bring you my second painting of 2013, which is of Neal’s Yard in London. If you’ve never been there, its a wonderful hidden gem right in the centre of London, tucked away in Covent Garden. Its home to Vegan restaurants, hairdressers and Herbal Natural Remedy Stores. Its a brilliantly colourful and eclectic area which sets itself apart from the rest of London which was just perfect for me to paint. As always, the original painting and limited edtion prints of the image can be bought from the Gallery that represent me, DegreeArt.com. The link for the website is below. I’m really pleased with how its turned out, I’ve had a great time painting it, as always. I hope you all like it!. Read more about… Neal’s Yard.